Kitchen Knife Set vs. Individual Kitchen Knives - Here's How To Choose! So you’ve got a great new kitchen, you’re moving away to college, or you’re setting up home for the first time? Or you want to replace your old knives for shiny new ones? But you need to know whether to buy a kitchen knife set vs. individual kitchen knives? 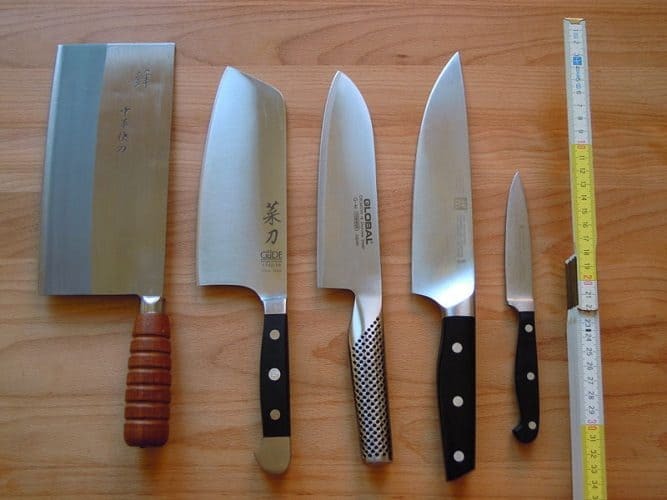 A set of good kitchen knives is something everyone should carefully consider – what is important to think about? But too many people rush into buying knives, without any real knowledge of what sort of knives they will use. What knives are necessary for successful cooking? And how do you properly store/care for your knives? Here is a guide to buying a Knife Set vs. Individual Knives, and a guideline to some basic and good knife sets. Knife sets often contain knives that you would never use. They come mixed in with a beautiful block (handy to have), and a couple of knives you will use all the time. The best thing to do before buying a knife set, or knives is to sit down for a minute, grab a coffee, and think about what knives you are constantly reaching for in the kitchen. Do you need a carving knife? Are you always going for that 6-inch utility knife over the bigger chef’s knife? Does your partner use a long blade chef’s knife and you prefer the smaller blade chef’s knife? Do you need a bread knife but not a cleaver? Most people need a chef’s knife, a bread knife, a utility knife and a more flexible knife like a fillet or boning knife. Also, leave room in your kitchen planning for serrated knives and paring knives. Once you have an idea of what you will use you can go shopping. If you find a set that features most of the knives you use, plus a block with a few spare spaces, why not buy it and simply add a couple of the missing pieces? Perfect! If you are unable to find a set that comes with the knives you want, then you simply pick up the knives you do want on a case-by-case basis. This is the perfect option for people who want multiples of the same knife. Chopping Garlic – Do I Need A Duplicate Knife? Myself, I use a lot of knives! And I use them a lot! I don’t like to chop garlic, wash the knife for the next ingredient. I wash while the food is cooking! So for folks like me – I recommend a great knife set, with a really good one of each of the knives, and then also adding to the set, by buying individual extra knives, that you are always using. I have multiples of bread knives, chef knives, paring knives etc – the ones I don’t want to use on meat, and then veg, and then meat etc, but that I use constantly. OK – I might be just a little lazy – it’s much better for me to have a few! This set contains the three most important knives for a basic kitchen set up; a chef’s knife, a utility knife, and a paring knife. It is the bare basic setup but it’s a quality brand. Wusthof make great quality kitchen knives, which are durable and will be used for years and years. This German steel knife set contains knives that are sharp out of the box. Be careful! Henckels’ make fantastic kitchen knives. They are famed for their quality and have a variety of different ranges and styles to choose from. They offer a great value 19-piece knife set, which is enough for any kitchen’s needs, and the knives are all made in Germany. The blades come sharp and keep their edges for a long time. They should be washed (carefully) by hand and never in the dishwasher. Do you use many knives, or one or two? What sort of work do you do with your kitchen knives? Do you need multiples of any type of knife? Look after your knives – they can last your lifetime! Chef Knife – Ultimate Comparison, and Reviews! Caring For Quality Kitchen Knives! And here’s the proper way to prepare garlic, with your new kitchen knives!!! Thanks for breaking this down for me. During preparations for Christmas I realized I didn’t have the range of knives I needed to cover everything – which was a little embarrassing with the whole family around. It’s been quite a while since I properly evaluated my kitchen knives. Time to invest in a good quality knife set, me thinks. It’s easy to become accustomed to what we have, it’s normal! and sometimes not notice that a small investment could drastically improve our cooking, and enjoyment of our kitchen time – good point! I’m going to re-evaluate the other parts of my kitchen equipment now!